A novel of friendship, passion, and art --focusing on a young disabled woman in mid-century Maine-- inspired by Andrew Wyeth’s mysterious and iconic painting Christina’s World. Kline alternates chapters, going back and forth in time (from 1896-1948) with riveting effect. We see a young girl struggle with a muscle disease that worsens. We see a teenager fall miraculously in love with a dashing Harvard student who reciprocates that love. We feel the pain and embarrassment when the man jilts her, and we are witness to the sad state of her eventual spinsterhood ... Like Wyeth’s paintings, this is a vivid novel about hardscrabble lives and prairie grit and the seemingly small but significant beauties found there. Their scenes together, just talking, and the scenes of Andy working, figuring the angles and details of his portraits and landscapes, are among the most appealing in the book. Through his eyes, Christina sees ordinary tools and objects in a new way. The rote familiarity of the farm becomes transformed. Yet it’s Andy’s acceptance of things as they are that Christina finds so heartening ... This book about hardship and pride, friendship and empathy, starts slowly before finding its pace. Once there, the story moves briskly. In the hands of a lesser writer, Christina’s plight might seem unwieldy or mawkish. 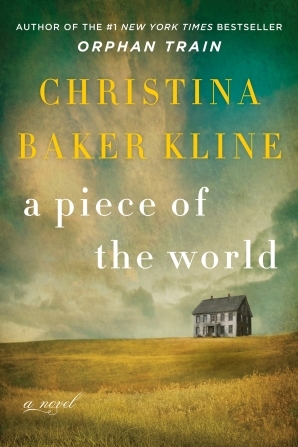 Yet Kline has a graceful, arresting style that lifts the narrative, and her portrayal of Andy leavens the entire story. For as much as we learn about the life and times of Christina Olson, it’s Kline’s rendering of Andrew Wyeth – decent, charming, wise – that leaves us wanting more. Meticulously, Kline documents the sheer physical toil required to survive in a home without electricity or running water, knocking the sheen off the nostalgic myth of an idyllic rural past ... The novel evokes the somber grace of those paintings in language as earnest and straightforward as Wyeth’s brush strokes, laying out a story as uncomplicated as his composition. Both painter and writer have a fine-grained feel for the setting, and both would seem to reject the irony, humor and abstraction of modernity ... Yet in expanding on Christina’s story, Kline defies what some might see as the strength of Wyeth’s work, its undercurrent of mystery ... In contrast, Kline sometimes over-explains, spelling out thoughts and feelings already apparent from the action and dialogue. This approach serves readers who want to fill in the blanks, to experience the daily grind of a way of life that often has been burnished by the passage of time, to honor the rectitude of people who stoically shoulder their burdens and get on with their chores. A Piece of the World is a story for those who want the mysterious made real. What did you think of A Piece of the World?